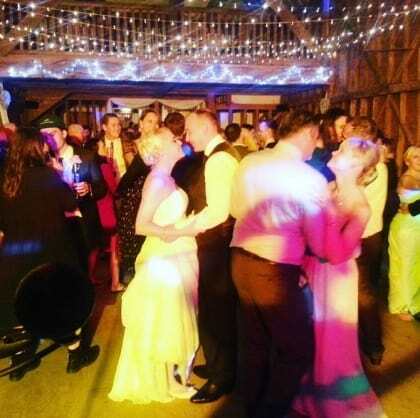 Tewinbury farm, near Welwyn, Hertfordshire, is a family owned working farm which just happens to double as a very popular wedding reception venue, so it was only a matter of time before Hard to Handle band were asked to perform there. Laura and Matthew had seen us perform at a friends’ wedding reception last year and wasted no time in contacting us on 0796 433 5657 to see if we were available. Suffice to say, not only were we available but Laura and Matthew were pleasantly surprised to discover that we were a lot more cost effective than many of the other bands advertising themselves as suitable for wedding receptions (one day we’d like to meet one of the millionaires who seem to be able to afford the fees commanded by some of these bands). The big day came. We arrived in plenty of time, loaded our equipment into the Tythe barn, set up, performed a brief sound check and we were ready to rock. Which is exactly what we did! Two hours of great sounding live band music, with added DJ music at no extra cost. Which is, if you’ll pardon the pun, music to our ears! So, if you’d like your own personal professional wedding band to wow your guests, get in touch and we’ll do the rest!